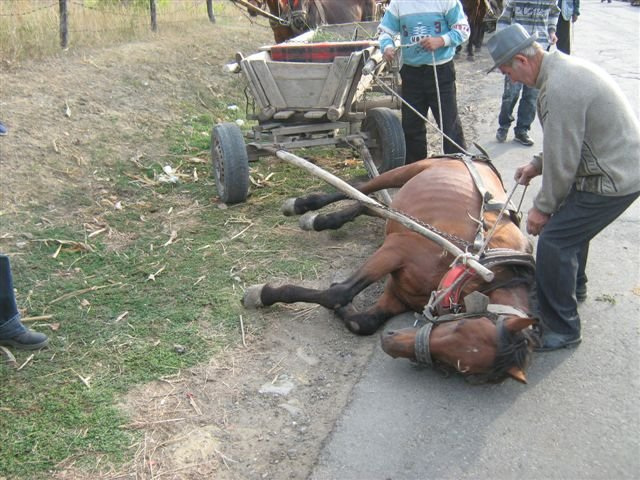 Romania still use horses and donkeys for everyday use in agriculture and transport. 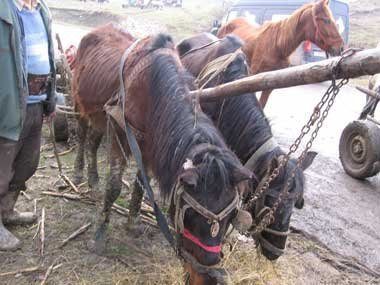 Some parts of the population live under poor conditions and the use of horses and donkeys is a cheaper alternative to vehicles - Recent estimates put the number of horses still used for agricultural purposes in Romania as high as 760,000. 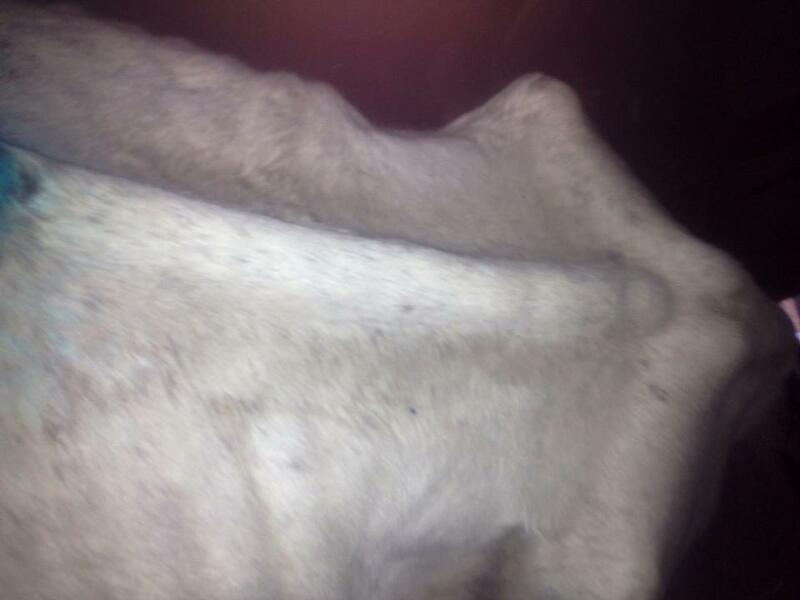 The horses and donkeys often live under harsh conditions with little food and many hours of work. Many horse- and donkey-owners are driving their animals too hard and do not understand, or do not care, why the animals can not manage what they are supposed to do. 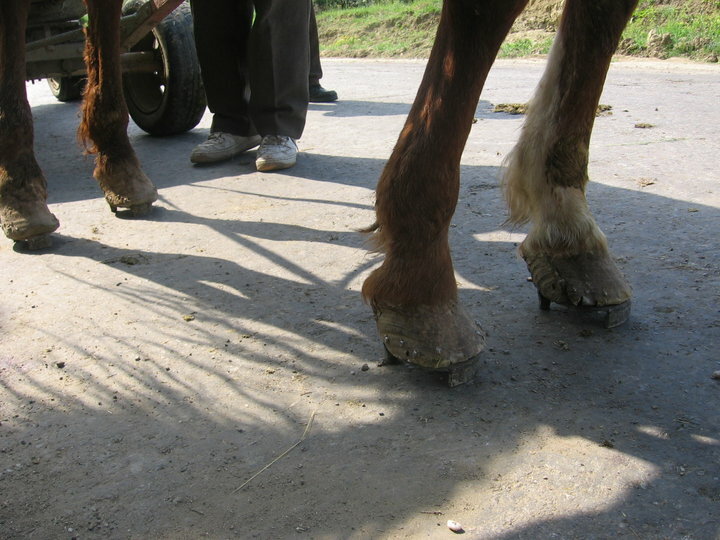 They also use simple traction devices which chafes and hurts the animals. Many of the animals have large blisters, large open wounds and hooves and teeth are not taken care of by their owners. The animals are often mistreated and beaten to make one last effort. When some owners get tired of their animals, they simply drop them somewhere to starve to death or just kill them. Unwanted horses and donkeys are also exported to other European countries for meat consumption. 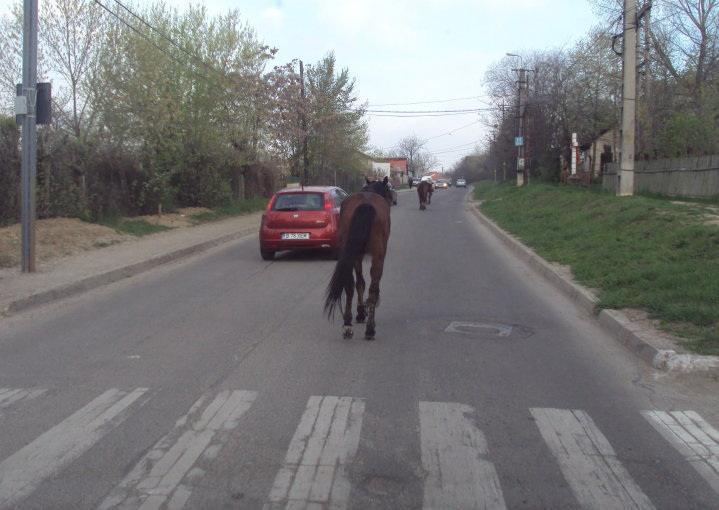 It may be, unfortunately, a sense that there is a throwaway culture for both horses and donkeys in Romania. 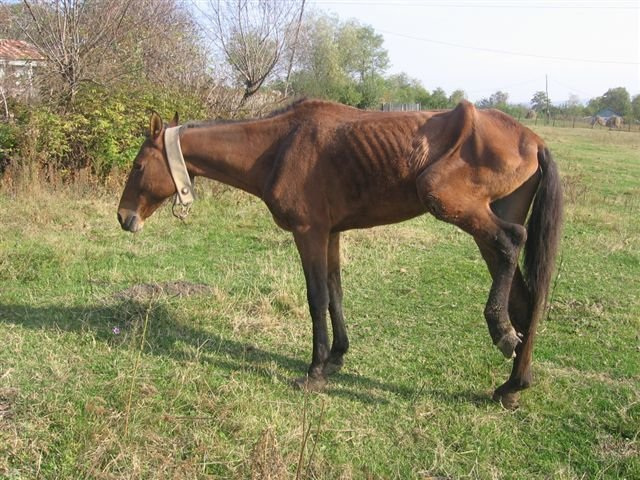 The ban applies for entry to the European Union 2008 - Ribs showing clearly through their tattered flanks, the starving horses corralled on the edge of the eastern Romanian city of Galati are just a few days away from death. Once, they would have pulled wooden carts along the city's streets or worked in the fields, as horses have done in Romania for centuries. But now they have been abandoned by their owners, victims of a disastrous attempt to bring the country into line with European Union law by banning horse-drawn carts from main roads. 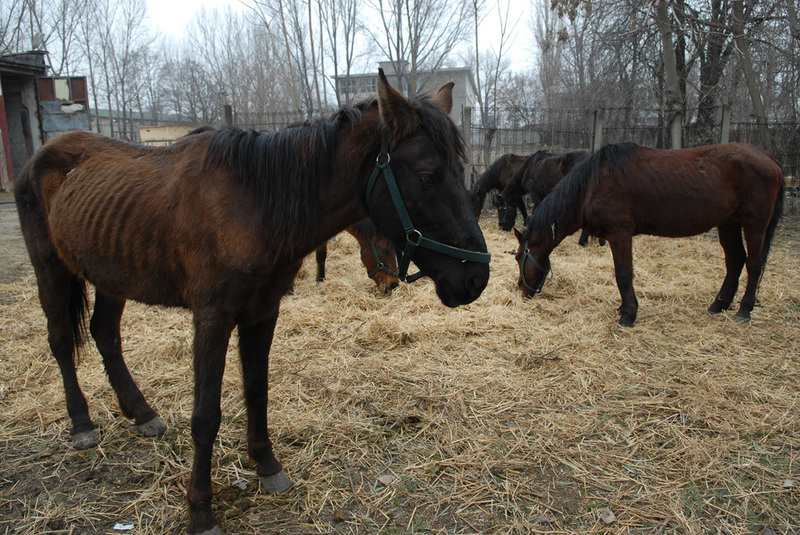 Over the past month, hundreds of stray horses have been found roaming the streets and parks of Romania's major cities. Many are half-starved and barely able to walk; some have died where they were discovered, unable to get back to their feet. Calin Alexandru, a vet who is co-ordinating Bucharest's attempts to deal with the problem, said it was a struggle to find homes for the horses. "We are seeing more and more abandoned," she said. "We cannot find their owners." In response to the outcry, the government is introducing tough fines and jail sentences for anyone found to have beaten or abandoned a horse. In response to the outcry, the government is introducing tough fines and jail sentences for anyone found to have beaten or abandoned a horse. 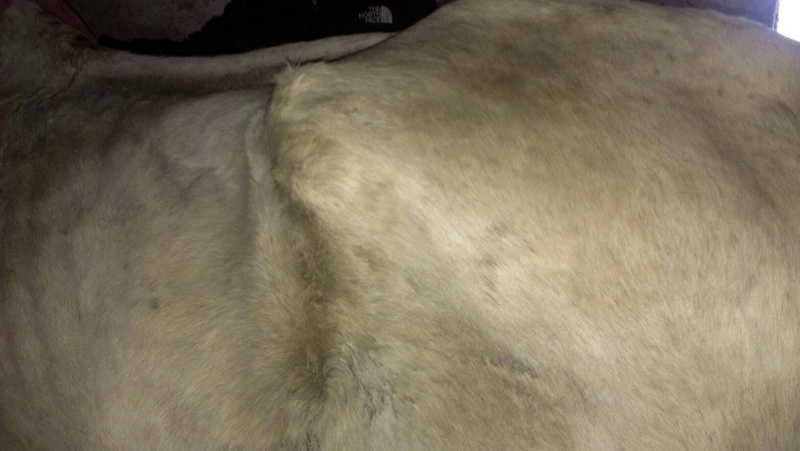 It's not just stray dogs that are used as money-maker in Romania, there are also horses that people trying to sell to other countries. Many of the horses are sick and have contagious diseases. These problems apply not only Romania, but also to other countries in Europe, where segregation is high and poor residents trying to survive the day. But the atrocities continue - It is all too common fate of Romanian horses and donkeys - if they do not manage anymore - first almost beaten to death - then left to die - alone and in agony. Animals who can not pull more, being abandoned at the roadside - beaten to death or left badly injured and shocked - alone. Romanian journalists and reporters are busy reporting on all the horrific events in the country - when will Romania sort out the animal protection laws and start to punish animal tormentors? 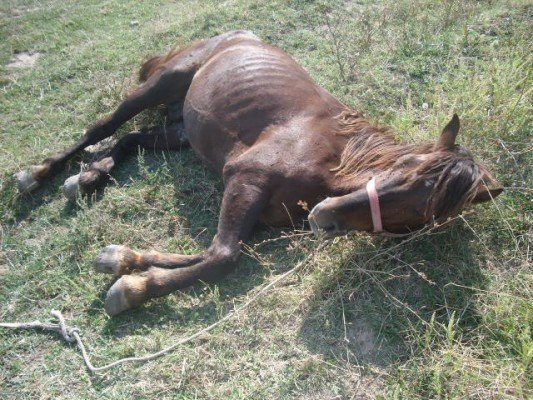 (January 11, 2013) - This is the horse that I have seen almost 2 weeks ago, starved, full of wounds that fells down because she is starved and beaten. Since then, I was negotiating with the *gypsy that owns her to give it to me and I also looked for transport and food for her. I will need to raise at least 250 E to transport her, buy food, veterinary treatment and pay the *gypsy. 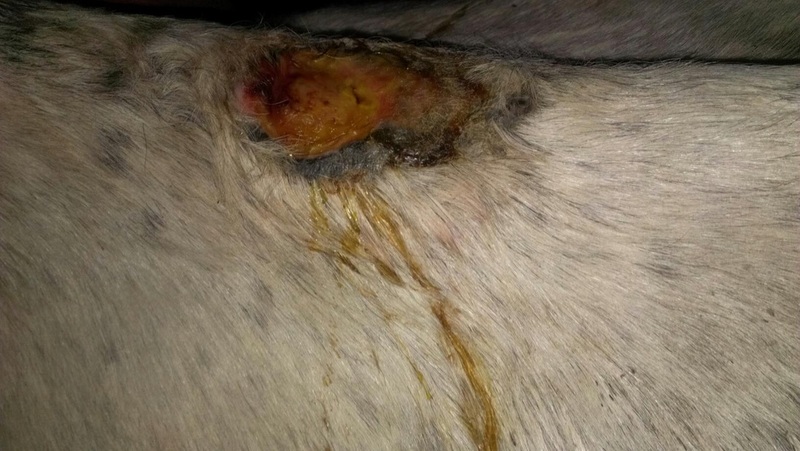 The wounds can't be seen in the pictures as the *gypsy refused to take the blanket from her, but I will try to take pictures with her wounds soon. 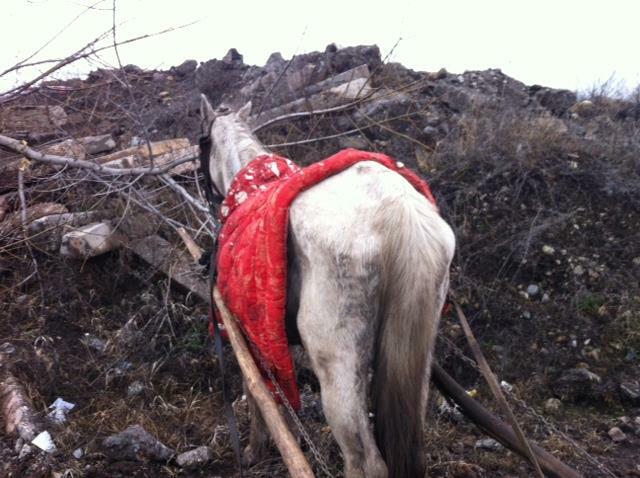 Also the people that know the *gypsy and the horse told me that yesterday, she fell 3 times and there are days that she doesn't eat anything or she eats 2 breads in the evening when some neighbors give to her, still she is forced to pull the cart with 2 tons of steel. ESDAW *disassociate ourselves to single out ethnic groups, since this has to do with the animal protection laws of the country and not ethnic groups. 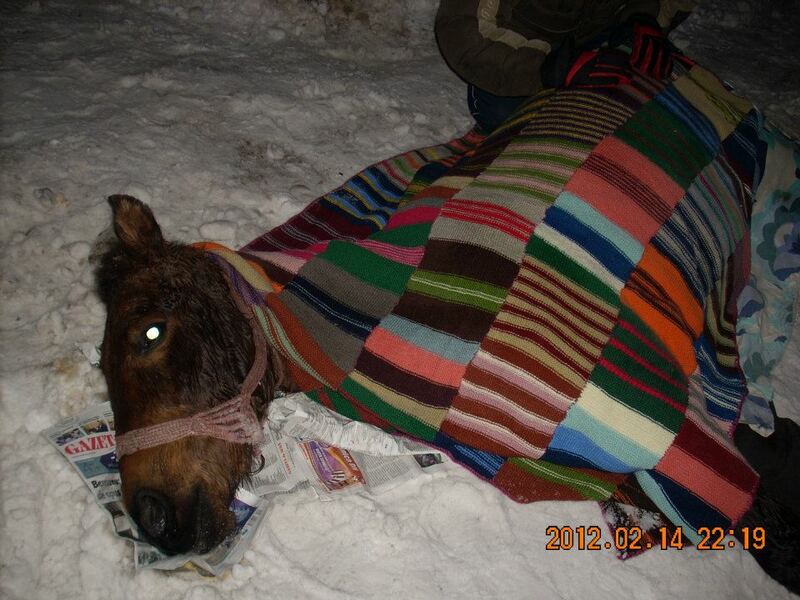 Pictures of the horse after the rescue operation. 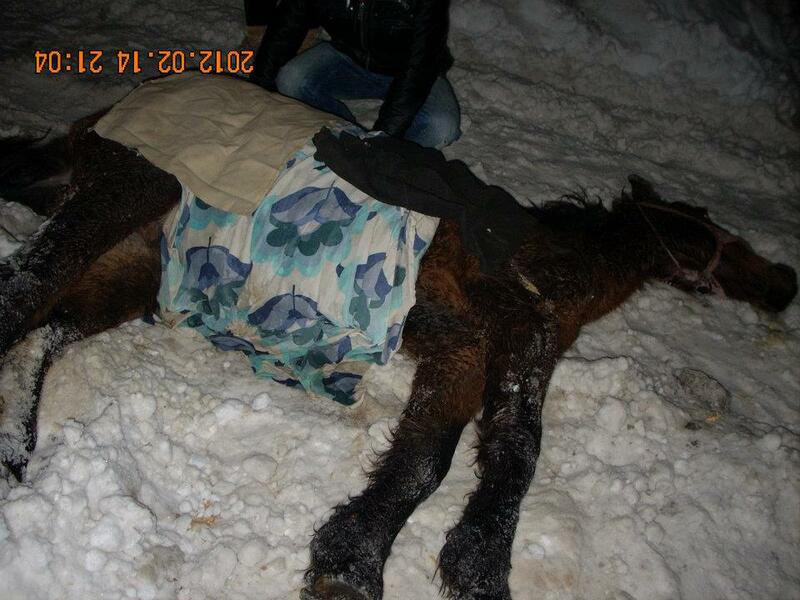 HORSE beaten and left to die on the street - ROMANIA 2012! 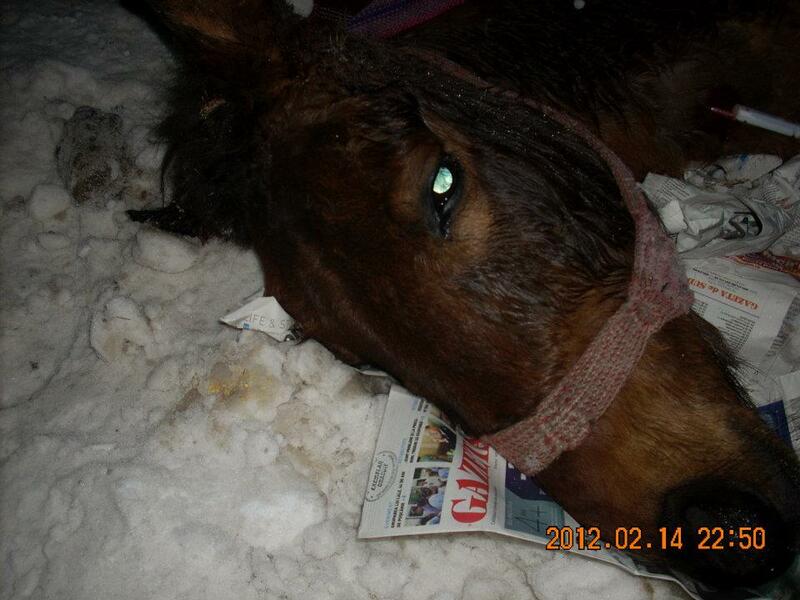 Romania - February 15, 2012 - Post from Facebook - It all started with a post on a Facebook page, last night around 19:00 o`clock, was a desperate cry for help: someone ask for help to go to a horse that fell in the midle of the street, abandoned after being starved and beaten until he felt. In post: We knew from the beginning that is different from other cases: dogs, cats. And we will fight with windmills, but still we hoped that maybe this time will be different. And we went to the animal and found him in agony in the snow at -15 degrees. After about half an hour, we reach a road where we see a police car and several people who looked helpless. 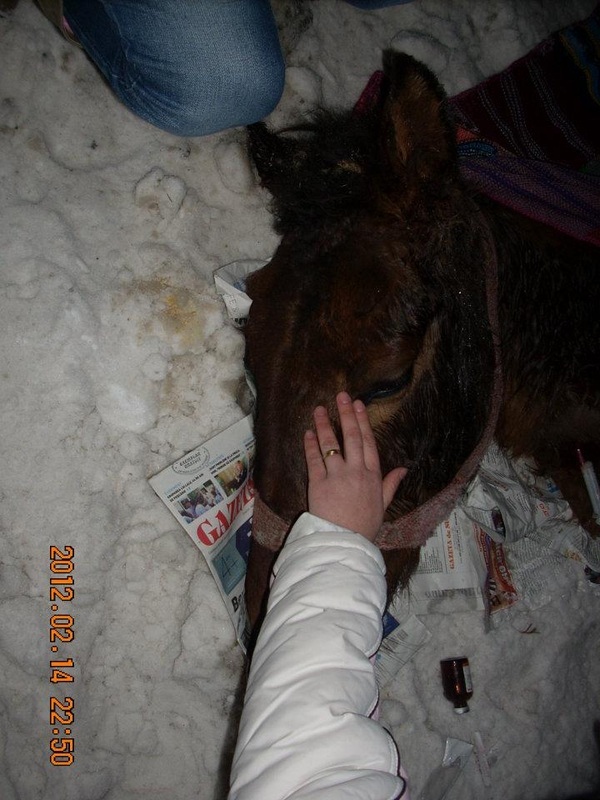 We stated that we need the help of a veterinarian and firemans to help us raise a horse in agony in the snow at -15 degrees. We got the answer: firemans will not come cause they can`t do anything. 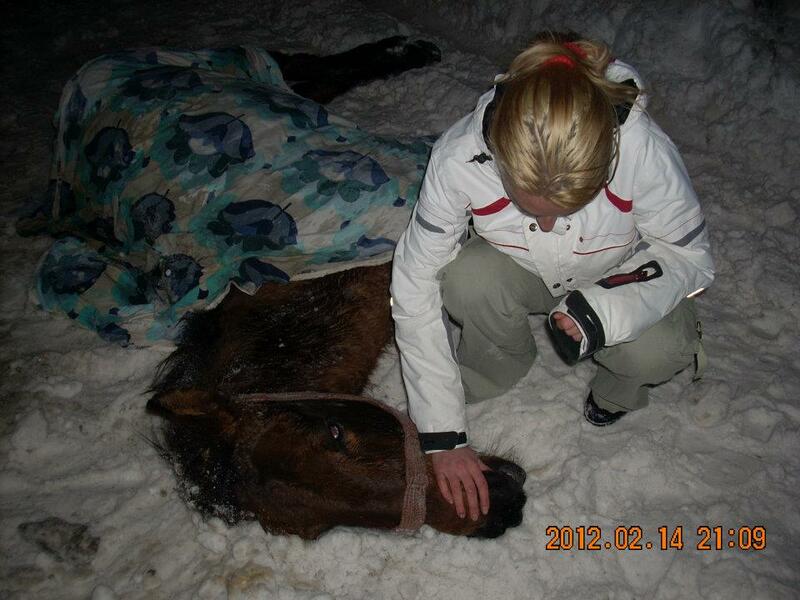 We asked again: we need help to raise the animal because we are four volunteers and we can`t manage this alone and the response followed by an ironic tone and derision was: but why is the horse in the snow? why he fell? I said I would like to have the answer .. they gave us a phone number of the cityhall, they can not intervene, the cityhall must intervene. We note the number and we called ,the answer: no help, the director does not respond to phone try again later ..
Ok can you send us a vetrinar? Answer was NO! No vet has no program at this hour. First vet that we contacted was famous doctor Avram, who takes care of local canine shelter Facai (death camp). He said, “I`m home with the family at the table, I can not do any good at it, come back tomorrow. He said he doesn`t take careof this area (the street where the horse was), someone else it is there Dr. Constantin, but I can not give you his phone number. We found the number of Dr. Constantin (Constantin is medical doctor's concession hall) ... What you think he said? He is not in town, is 10 km away from Craiova and would not come anyway. Why disturb him at midnight? Let the horse there and we go to him in the morning at 7:30 at the cabinet! He said leave it alone, to go to him in the morning. While I try to call the authorities, the colleagues asked for help from the press. But we all hit the same refusal! Nobody can, nobody knows, nobody wants anything. I called the cityhall again: finally we were told they would send a machine to come to the horse (still alive) to take him in the park at the zoo and food for lions. At that time I would have liked to dream, is not really what happens, what we see, what they can`t come to take an animal still alive and to kill him to give him food to other animals? Is it true what I hear? In a few minutes I realized that time passes over us and if we do nothing will come and it will kill him. It is hard to say what we felt. Never mind anything now, at all costs we must find a vet. In Romania a vet it is not aloud to take care for a horse that doesn`t have a chip (it is illegal), he only can to put to sleep the animal. Poor suffering animal is coming to an end ..... what to say I got to enjoy that will kill an animal? We had to take this decision at least he didn`t died alone, there was someone beside him in the last moments of life.... four people who loved him! Thanks for the veterinarian that ended the suffering of the innocent soul above all! Thanks for the community police that stood with us in the street! Thanks to Pro TV team that came there! Thanks to all authorities who have thrown the responsibility upon themselves! Thanks to those who stood home at the heat while some poor soul struggling between life and death in the street in the snow at -15 degrees! 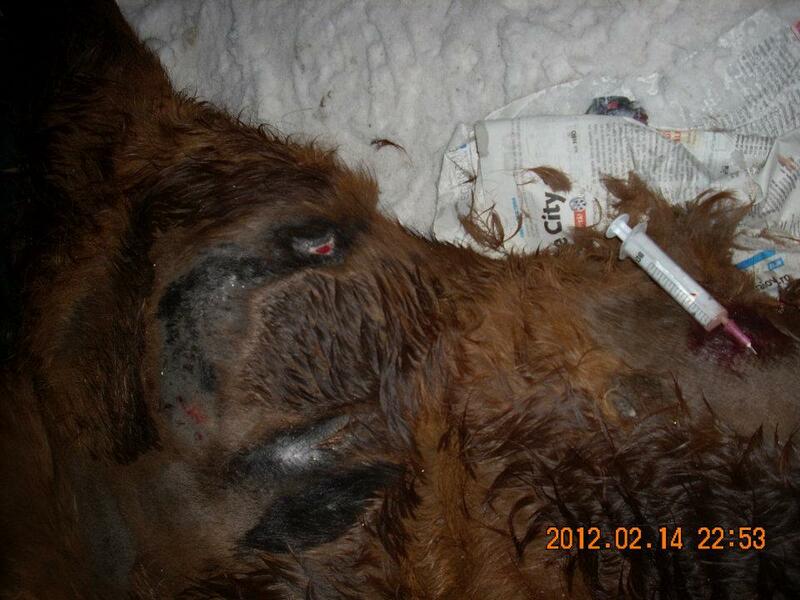 Romanian draft animals are just tools - to be torn out and replaced. 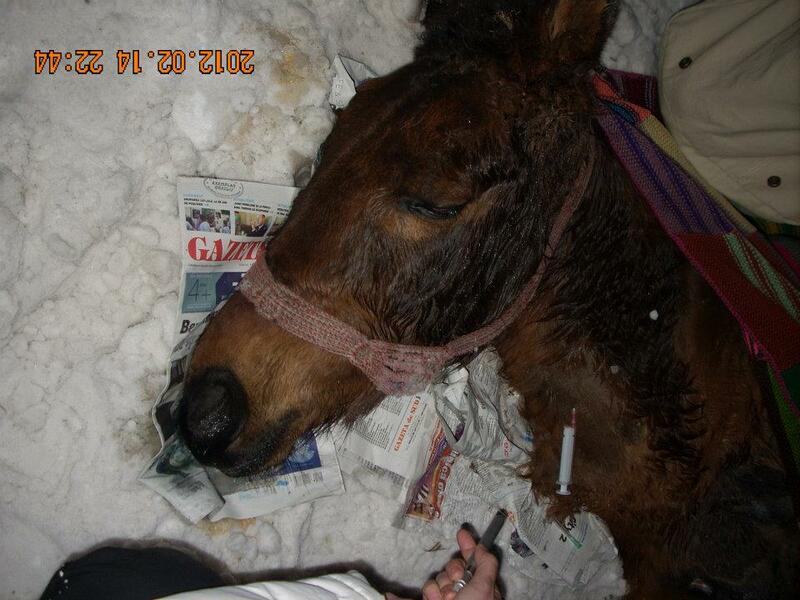 To beat horses and donkeys in Romania is more the rule than the exception. 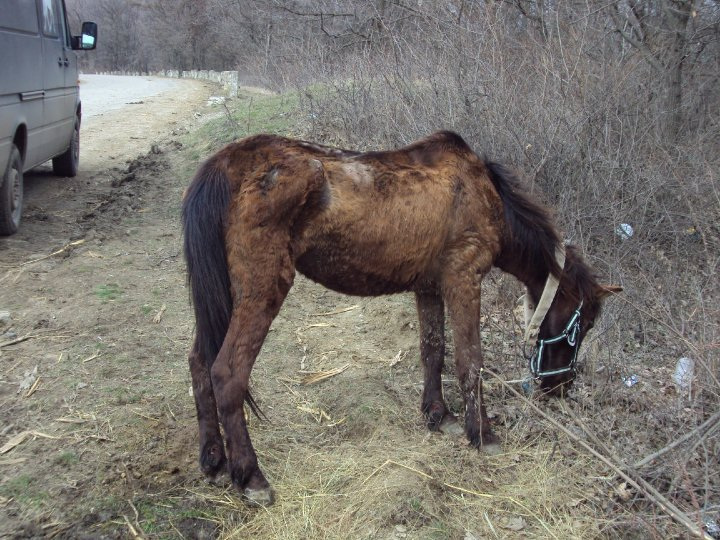 Animal Friends in Romania will do anything to help - but it is an uneven struggle - The horses are abandoned, homeless, tied in forests without water or food. 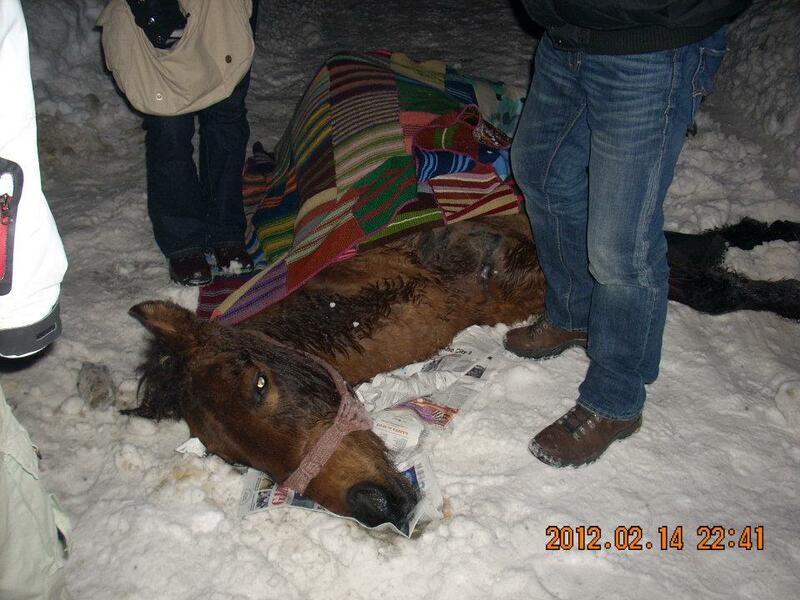 It's not the horses' fault that they were born in a country like Romania, no love and care only hunger and anguish. Merita is given a second chance, a chance that vet Mrs. Ilinca Cioculescu gave her by creating a shelter and keep them off the streets and forests - more dead than alive. The shelter called the Star of Hope, they need our help in order to live, to recover, to learn the feeling of being loved.